Jithin Paul, once India’s top 400m hurdler, had his athletics career derailed by a doping violation that should never have been. His case holds hope, and some very valuable lessons, for elite athletes in the country. This is his story. He looked pale and confused. The smile, and the air of self- assurance I had come to associate with Jithin Paul were missing. They were replaced by an eerie nervousness — a much darker iteration of the energy he had carried since the mid 2000s when I first met the 400 metre hurdler at a national-level athletics meet. I had seen him like this once before, though, at the Incheon Asian Games in 2014. There, he jumped the gun at the start of his race, and the pain of an ignominious exit, losing a race without even running it, reflected on his face. Disappointment and disbelief writ large as he walked away from the starting block, escorted by an official. About three years from that day, in May 2017, darker clouds hovered over Paul’s racing career. And, he wasn’t just upset, he looked afraid. Paul has always been frugal with words — this reserved demeanour was offset by an expressive face that always told you what he was feeling, even when the words did not. That day in the summer of 2017, he came to my apartment because he was in a confused and concerned state. He was out to seek affirmation and assurance. To understand whether those he had considered his support system would continue to back him or he would be left alone. But, most of all, to find reassurance that his career — he was India’s premier 400m hurdler at the time — wasn’t doomed in the wake of events that had just transpired. Paul received communication from the National Anti Doping Agency (NADA) on May 22, 2017, that he was “provisionally suspended” for a code violation. The charge was not one of doping, but the equally serious allegation of being in “possession of a banned substance” in violation of Article 2.6 of the Anti Doping Rules of NADA/WADA Code 2015. According to the NADA report, several vials of Meldonium, which was a legal drug till 2016, were found in a bag taken by one of its officials following a search of Paul’s room at the Milkha Singh Hostel of the Netaji Subhas National Institute of Sports (NIS) in Patiala, Punjab. Paul maintained at the time — and still does — that he did know the contents of the bag which he says had been “lying” in his room “since 2013.” Paul also claims that the NADA officials who came to search the room in Patiala that day found vials containing Carnitine, a fat burner that is not on the list of illegal substances, and not Meldonium, as claimed in the NADA report. A year after that difficult visit, Paul was in town again. He had been cleared to race — the charges made by NADA did not stick — but the appeal process that won him vindication and freedom had come with a heavy price. Paul had to sit out the 2018 Commonwealth Games on the Gold Coast, and the Asian Games in Jakarta — since the appeal victory against NADA’s ban came too late. Watching his former teammate Ayyasamy Dharun win a silver in his event at the Asiad, Paul was sad, but not bitter. He believes a medal was a genuine possibility for him in Jakarta. This depressive longing for “what could have been”, comes with an even more crippling reality. Paul saw a career full of potential (though far from a super-athlete or one who might have taken Indian hurdling to new heights, Paul was among the nation’s elite in his discipline) take a dramatic nosedive over the course of just a couple of months. His victory over NADA is a crash landing, at best. Through no fault of his own, Paul might never race at that level again. Time, of course, will tell. But his words, when he walked into my apartment last Sunday revealed how much the episode has dented and damaged the athlete within. “I think I will quit,” said Paul, while, like a cruel joke, the closing ceremony of the Asian Games began, the images from Jakarta flickering on the TV, forming a visual backdrop to our conversation. The Games in Indonesia were coming to an end, while thousands of kilometres away, Paul was contemplating euthanizing his career. Paul looked a bit weary, but it wasn’t all bad... Colour and life were back on a face no longer clouded over with doubt and fear, as it had been a year ago. The 28-year-old, in fact, was happy that his ban was revoked at the appeal hearing against the NADA verdict, a vindication of his innocence. But the bitter taste, and trauma — a form of sports PTSD even — remained. We spent the next couple of hours talking about whether he should quit the sport he had given the past 15 years of his life to, or stick around to prove a point — to himself as much as to anyone else. “It might help me if I talk it out and get some of the baggage out of my system now that I am looking ahead to train and race,” Paul said. Whatever the future held, Paul decided — the showcase of myriad colours celebrating Asian athletes as a background score — the place to start was that fateful day back in his hostel room in Patiala, when it began to unravel, and, at the prime of his running prowess, he was forced to run a dark and depressing race against time. It was that time of year when India’s elite athletes, based at the national camp in Patiala, would wind up their training stints at the NIS. The idea is to train in other places, where the brunt of the long, hot Indian summer is relatively easier to bear. Paul was sharing the room with Kunju Muhammed, who was in the news recently as part of the 4x400 men’s relay quartet that won silver in Jakarta. The athletes let the official in, confident there was nothing in their room which could land them in trouble. They were unaware that an anti-doping official had no right to conduct raids inside an athlete’s residence or room on his own. In case they had to conduct a search, as per law, they have to use the police, or any other law enforcement agency, to execute it, armed with a warrant that too. “We let him in because our coaches have always told us that when a NADA official asks you for something, be cooperative or else that could also warrant sanctions. Besides, we had never doped and were confident there was nothing in the room which was illegal,” said Paul. The official pulled out the bag, which Paul acknowledged was his. Here is where the plot gets murky. The athlete insists the vials discovered in the bag were of Carnitine, a fat burner which is legal. The ammonium compound performs the role of transporting fatty acids to the mitochondria where they can be burned down by the body and used as fuel. It is widely used by professional as well as amateur athletes and bodybuilders. “It was Carnitine and it was lying in that bag for years,” Paul told me. “I was asked to sign on the form by the official and I readily signed because I knew it was a legal substance and nothing would happen,” he added. In hindsight, Paul feels he should not have let the search be conducted in the first place. The same official later tried to search a couple of other rooms as well. One belonged to senior athlete OP Jaisha. He was not allowed to enter, with Jaisha pointing out that proper procedure was not being followed. Paul, meanwhile, forgot about the entire incident soon after, as he got busy with the summer training schedule. He was focusing on a target time for the important 2017 season which included, among many meets, the Asian Championships in Bhubaneswar, and the IAAF World Championships in London. It took a little over a month before Paul heard from the NADA again. The letter not just shocked him, but shattered his resolve. The 28-year-old started training athletics in 2000 when his talent was unearthed at his school in Chalakudy, a town in Thrissur district of Kerala. He was absorbed into the Sports Authority of India (SAI) hostel in Thrissur in 2004. Four years down the road, he won his first gold at the nationals as an 18-year-old. From then on, he has been part of the national team. He recorded his personal best — 49.79 seconds — during a run that earned him a silver medal at an IAAF Grand Prix meet in Slovakia, in 2016. According to Paul, he would have breached the 49-second barrier in 2018. To help understand what Paul might have been feeling when he watched Dharun race to a silver medal in the 400m hurdles in Jakarta with a time of 48.96 seconds. An improvement of a second or so over the course of two years is realistic in 400m hurdles, an event where pace is not just correlated to physical strength. 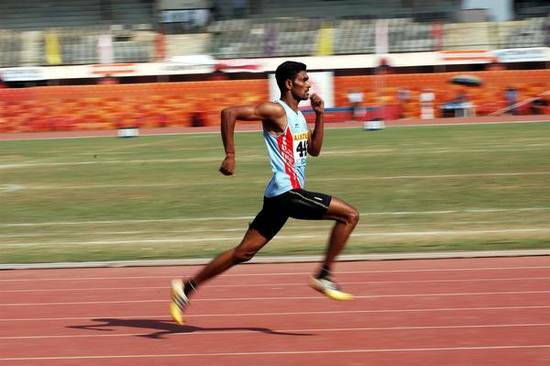 Rhythm and technique are paramount factors too and many in Indian athletics feel Paul had the right technical base to become a sub 48 seconds runner by 2020, the year of the next Olympics. Paul’s performance metrics are on record, and his development as an athlete could give us an idea where he would have been, performance wise, this year, and what he missed. However, what’s not on record is how 15 months, starting from May last year, till now, has undone 15 years of systematic and single-minded hard work. In June 2017, NADA’s court proceedings ensued after Paul was slapped with the provisional ban. Again, the early notion when the hearings began was that in two or three months, a verdict would come out and the ban would be revoked. Or so Paul and his team assumed. However, within a month Paul realised that this race was going to be long and tricky, and his resolve would be put to the ultimate test. An athlete’s training, especially a hurdler’s, is not just about running and lifting weights. The fine-tuning involves everything from his mind, to the stride length, to his heartbeat. Running hurdles is like performing a ballet. There is an exactness that science brings in and the artistry a human factor, that the runner, comes with. Both combine in beautiful harmony only when the quarter-mile ballet is repeated on and on in training till muscles memorise the rhythm and running the circuit becomes as natural as breathing. February 21, 2018 was Judgement Day for Paul. Despite there being as many holes in the NADA case as a round of Swiss cheese, the verdict fell heavily against the runner. NADA had held Jithin Paul guilty of the charge of being in possession of a banned substance and suspended him from the sport for four years. For Indian athletes, who operate in a strange quasi-professional system, these major events are vital from both a personal and professional perspective. They offer the infrequent opportunity to represent the nation against other countries. Winning medals at such events are considered “bringing glory to the nation”, and carry rewards such as mass publicity, cash prizes from state and central government bodies and promotions for those working in public sector jobs. Missing out on a season that includes both the Commonwealth and Asian Games is almost akin to throwing away a four-year cycle of training and preparation. By June 2018, 14 months after his room was illegally raided, it was more-or-less clear that Paul’s ban would be revoked. The question was whether he would have enough time to attempt qualifying for the Asian Games. But by then, Paul himself had gone into a dark zone. “I had decided to quit and focus on my career at the Income Tax department,” he said. He had given up on athletics and did not see the appeal as anything more than an attempt to clear his name; to not be known a drug cheat. The verdict came on August 14. Paul was cleared and the ban revoked by the appeal panel chaired by Justice (retd.) EV Easwar, who found serious shortcomings in NADA’s case against Paul. The verdict came four days before the opening ceremony in Jakarta, and 13 days before Ayyasamy Dharun won his silver. While pronouncing the judgement, the panel also observed NADA had made “serious violations of the rules of natural justice” in handling the case. The Indian anti-doping agency clearly committed a big blunder here, and that mistake has jeopardised a promising athlete’s career. NADA’s disregard of procedure in Paul’s case, which cast a doubt over its credibility during the appeal proceedings, will also pose a huge question mark against the organisation which has had quite a good track record in monitoring athletes and sanctioning dope offenders. In a report published by the World Anti Doping Agency (WADA) in 2017, India was ranked third in the world in dope violations (stats for the year 2015). And most of the violations — both “analytic” (after detection of a prohibited substance by a WADA-accredited lab) and “non-analytic” (offense such as possession, failure to submit to testing, trafficking and those made by the athlete’s support staff) — were caught by NADA. According to the report, 117 Indian athletes were caught in the doping net in 2015, while Russia topped with 176, followed by Italy (129). India, in fact, was third in 2013 and 2014 as well, while it was ranked sixth in 2017 (69 offenses). The big numbers, and also its decline in the past couple of years, is an indicator that India’s national anti-doping agency is pretty efficient in its job at nabbing offenders as well as deterring the athletes. However, Paul’s episode and subsequent discrepancies, show us the plight of the athletes if the agency doesn’t show diligence, professionalism, and even empathy, while initiating and implementing anti-doping procedures. After all, NADA is not just testing blood samples here, it is also putting on the line an athlete’s life and career, as punishments range from two years (for juveniles) to four, eight and lifetime bans for seniors. During the course of Paul’s appeal hearings, NADA, through its legal team, apparently maintained that it had every right to search the dorms or residences of athletes if situation warrants, especially when they are housed at Sports Authority of India (SAI) facilities. This claim was proved wrong by Paul’s legal team, which produced a response from WADA’s legal department, stipulating the guidelines for search procedures. Paul, here, was lucky because he, as well as his legal team, were aware of the athlete’s rights, and the procedures which NADA should have adhered to. There could have been similar cases to Paul before him as well, instances where due procedure was not followed but the athlete accepted his or her fate unaware of how things are supposed to work. It is anybody’s guess. Paul’s appeal is unlikely to lead to a massive reopening of cases from the past to examine whether the agency was doing it job in keeping with the law, or whether it has been acting as a vigilante, dealing out summary justice in whatever manner took its fancy. But it is an important lesson for others in the mix. Knowing the rules — starting from the substances an athlete might take during training, to how and when dope testing is meant to take place, to the legal procedures and fallout — is fundamental. In an internet powered world it is increasingly unlikely that pleading ignorance will serve as any defence for those held in violation. Paul’s appeal, and his vindication, may not be enough to salvage his own career as a 400m hurdler. But it will not be completely in vain if thousands of Indian athletes learn from the systemic malaise that caught him in its net. Coaches and athletes alike must take this as an opportunity to learn how it works, understand their rights and the safeguards that exist, and fight those in powerful positions when due process is ignored. That will be Paul’s real big victory. The NADA has an ethical ideal to live up to and fulfill, much like the one the country’s judiciary adhere to — no innocent should ever be punished. In Paul’s case, they have thrown that maxim out of the window, while breaking the back of an athlete’s dream, his lifelong mission. That mission needs resurrection. I tried to remind Paul that the overturning of the ban is in itself a big victory. He nodded, before agreeing that this could be the start of a journey that may see him record many more victories, more importantly, in his element on the track, and not in a courtroom. “I guess that’s what I would race for now, to prove something to myself first and then to the world,” he smiled again, revealing a fleeting glimpse of that old Paul. It will not be easy. Paul reckons he is around two seconds slower than his personal best at the moment. While some of that time he can shave off with focused training for a couple of months, the rest is going to be tough. “There is an Asian Games in four years’ time,” Paul said, as he got up to leave. It sounded more like a statement to himself than to me. They say an athlete’s best friend is himself. Over the last one year or so, Paul was less interested in talking to that best friend. Now that he’s back, the long road to salvation and fulfilment, with many quarter-mile ballets, lies ahead.